Jacks or Better video poker is the oldest variant of video poker around. Also known as Draw Poker, it’s still highly popular to this day.If you’re a player that already familiar with five-card draw poker, then getting the hang of how to play Jacks will be much easier. But for those South African players who don’t, no need to worry, our guide will help you along the way. In this Jacks or Better guide, we’ll be looking at the different hands, a simple playing strategy, and rules. Also, we’ll look at the standard pay table in a game of Jacks. Below are our recommended South African casinos with some great Jacks or Better video poker games. The first step in becoming good at playing Jacks or Better is learning the possible card combinations. You should be able to know the good hand from the bad, and how to build one. Let’s look at the possible winning video poker hands. Royal Flush: this is the best possible combination. The hand must have five cards in the same suit but they don’t have to be consecutive. Straight Flush: the hand is five consecutive cards in the same suit. Four of a Kind: at least four cards in your hand must be of the same value. Full House: this is when you have five cards made up of one pair and three of a kind. Flush: when you have five cards of the same suit. Straight: a consecutive hand with mixed suits. Three of a Kind: you get this combo when you have three cards with the same value. Two Pair: two pairs of cards with the same value. Jacks or Better: this hand includes only one pair of jacks or a higher value. This is the easiest one to get. You don’t have to stress about memorising the combinations. Most online video poker machines have a winning combinations table for you to reference while you’re playing. If you have four cards to a Straight or a Flush, hold the four cards and draw only one extra card. When you have three cards to a Royal Flush keep them. Proceed to draw another two cards. When you’re short two cards to making a Straight Flush, hold the three cards and draw two more. If you get a pair of cards, hold them and draw three more cards. Note that this tip may not always work. When your hand has no matching cards, hold the card that is equal to or higher than the Jack. Have no combinations or Jacks and higher? Discard and draw five new cards. When Should I Hold a Low Pair or High Pair? When it comes to learning how to play jacks, a common challenge for players is deciding if and when they should keep their low pair or high pair. What’s certain is a high pair is more likely to guarantee a win. It’s recommended that you keep all the low pair you get. While, there are also situations where it’s better to discard them. Let’s look at both scenarios below. If you have four to a Straight, keep the pair you have. For example, your hand is 5-5-6-7-8. Keep the 5-5 and throw away the 6-7-8. When you have three to a Straight Flush, keep the low pair. For instance, the hand you have is 3 hearts -4 hearts -5 hearts-5 spades – 9 clubs. Keep the 5 hearts and 5 spades. Find yourself in a situation with a low pair and two cards that result in a Royal Flush, hold onto the low pair. For example, 6 spades -6 hearts -2 clubs -King hearts -Ace hearts. Hold the 6 spades and 6 hearts. If you’re three cards away from a Royal Flush it’s best to discard the low pair. So, if your hand is 2 spades -Joker hearts -Joker spades -Queen spades -King spades, the probability of getting the best outcome is too high to keep a low pair. When you’re four to a Flush, throw the low pair. Usually, a high pair is guaranteed to win your round of Jacks or Better video poker. This pair is made up of two cards that are Jacks or higher in value. Let’s look at situations where you’ll break your hand in favour of the high pair. When you have four to a Flush along with a high pair, keep the pair and draw three more cards. If you have four cards to a Straight, keep the high pair to stand a better chance of winning. With a three to a Royal Flush hand, keep the pair because the odds of getting a Royal Flush aren’t high enough. Keep a high pair if you have three to a Straight Flush. This will get you better results. There are also instances where you should much rather throw your high pair. If you have four to a Royal Flush throw the pair because the odds are too high for landing this combo. 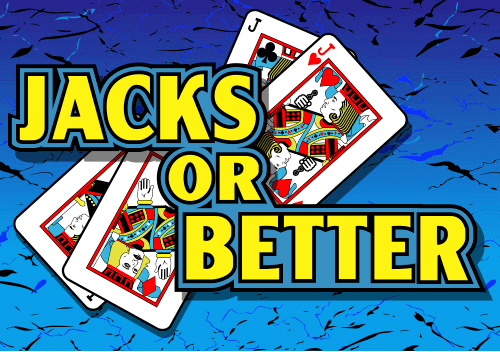 As we mentioned earlier, Jacks or Better is similar to five-card draw poker. 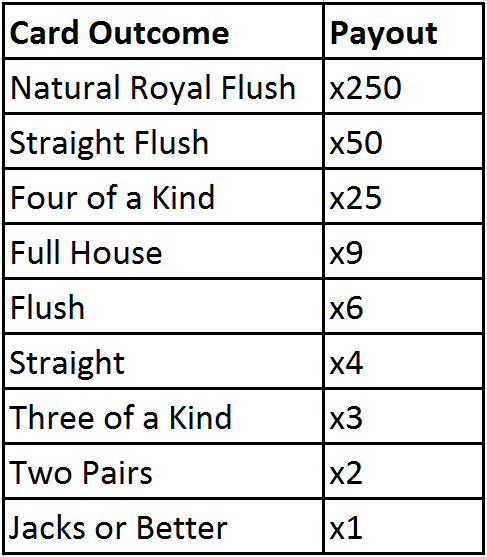 Here are some basic rules to this variant of video poker. There is no raising or bluffing. 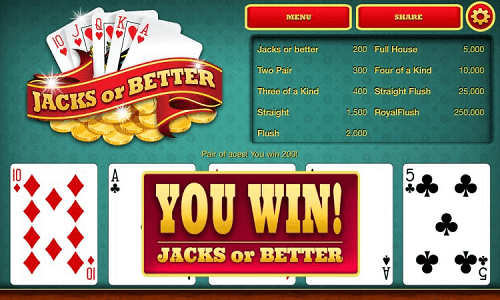 At the beginning of the game, you place one bet and the goal is to have a hand with Jacks or better. Video poker games have some of the highest payout percentages of all casino games. Where the typical house edge is between 90%and 97%, video poker offers up to 99.54%. The lowest hand that receives a payout is a Jacks and anything higher. Double check the pay table as they may be different to other games you’ve played. Below is a standard pay table as an example. Learn about poker with our related guides.